In the longing of preserving moments in time. 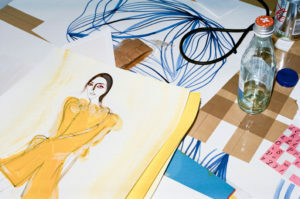 When she was stimulated as a child to draw people, London-based artist Tanya Ling could have never predicted that she would go on to becoming a renown fashion illustrator, “I never really planned to be a fashion illustrator. It’s something that, almost like a thief in the night, came and happened.” Tanya mentions, “It was very unexpected, but I am really grateful for it”. Creating everything from her own ready-to-wear collection, larger-than-life-sized sculptures, to intimate portrait drawings, site-specific installations, prints, or digital assemblages, Ling has experimented with a vast array of mediums, and uses her quotidian environment to stimulate her practice. 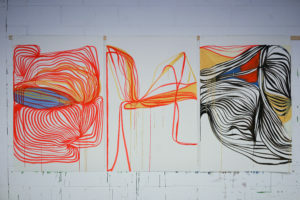 Despite her extensive use of materials, her work is best known for her recurring line drawings, which are in fact a continual line in the views of the artist. Ling’s technique is one of assembling figure and form intuitively, with a conscious material sensibility. The result is a brutal yet gentle scope of work which is concerned in the poeticness of just making. We met up with the artist during her solo show “We Have Life” where she expands on her need of capturing colour, braking sculptures down to their essence, and preserving moments in life. Tanya Ling (b. Calcutta 1966) studied Fashion BA at Central Saint Martins College of Art and Design, London. 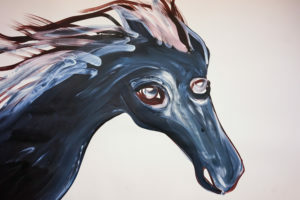 She has exhibited widely internationally and is currently living and working in London along with setting up a gallery space in the south of France. You have travelled from a very young age, having lived in Nottingham, Portsmouth, Sheffield, London, and Nigeria. To what point does your work adapt and influence itself from your environment? Could you guide us though your upbringing? I was born in Calcutta, and I came to London when I was three months old. As a child, I was very attracted to draw spaghetti junctions, crossover roads, carparks, or buildings, and then I started to get interested in drawing people. People had to be dressed, so therefore that’s how I started drawing clothes. Much of my childhood was spent drawing, as I used to move around a lot due to my father’s work, but drawing was that one thing for me that could stay the same, that I was the “ruler of the universe over”, it became my company. Drawing was my friend, which I could control, because everything else was changing around me, and in that piece of paper I could build up my world. Having said this, I didn’t think travelling was difficult, that’s just how it was, and due to my many travels, I discovered different smells, food, and people, and processed all of that information through drawing. At one point, my family realised that I was into art, and then my dad and granddad told me they would take me to Paris, “to go and see the best painting in the world”, the “Mona Lisa”. At that time, I was 8 years old, or possibly younger. We took a train to Paris during the summer holidays, and queued out for ages. I remember looking at this picture, hardly seeing it properly, and then I just said, “oh it’s amazing”. But it is amazing. So, in a way, I’ve always thought indirectly about the “Mona Lisa” when making figurative work. Timing for you is very significant: coming from a fashion background, how did you know when was the right time to concentrate in your art practice? I never really planned to be a fashion illustrator. It’s something that, almost like a thief in the night, came and happened. It was very unexpected, but I am really grateful for it. I got married and had kids at a very young age, and in a way, being a “Fashion Illustrator” has been brilliant, because I was able to not only keep a diary of my drawings and illustrations, but also live from it. Although, I’ve come to the point when I’ve wanted to accomplish a novel, I guess. I wanted to do something just for the poetic-ness of doing it, with no functional purpose, without operating within a team, and just to have the privilege of making. I started to focus on my art practice in 2013, so it hasn’t been long, and I guess that I wasn’t ready for it before. In terms of my line drawings, they haven’t taken long to make time-wise, although it’s taken me around 40 years to make those marks, and to get to that place. You were pioneer in displaying your work on social media in the form of a visual puzzle, by juxtaposing images. How important is the role of social media in your practice? I am a complete luddite, and it’s only recently when I have learnt how to send e-mails. So, my Instagram development, and the use of social media has also been a contradiction in a practical way. A friend and one of my children put me onto it, and I didn’t even realise how it functioned. So, I was just using it as a tool or as another found object, it was something else that I could use to make work with. That has really been my approach of Instagram. It’s that immediacy of being able to use that vehicle to do something. When I am using it, I sometimes blow images up, making them look bigger than they are, although it’s not only been made bigger, it’s all part of the work. I use pieces of work that I already have, or I use other people’s work, or anything to make something else out of it, and of course, I do understand things happen socially though it as well. Colour, fabric, and the use of different textures is frequent in your work. Is this an influence from having previously worked in the fashion industry? Everything does relate, and I find myself in a position where I want to use everything I can. It’s almost as if I see everything as part of a toolbox, and if I’ve got it in the toolbox, it should be used. Although, I’m not going to use it for the sake of it. I might be getting excited about Michelangelo’s sculptures or about Rebecca Warren’s work, even about something classical like Rodin’s garden, and all these thoughts are going on while I’m using what I’ve got in my ability set. I would never put myself in the situation where I’m going to make a big piece and I’m going to plan it previously, by making a ‘mini’ piece. To me, that process removes anything that moves me. So therefore, even when I am commissioned commercially, I don’t do roughs, nothing’s a rough, everything’s the real deal. You signature pieces are your line works. These lines have taken the shape of a house installation, fashion patterns, paintings, and drawings. How did these lines start? 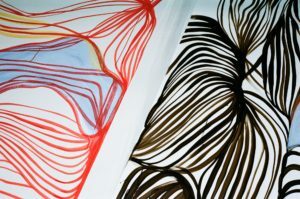 The line paintings are a part of my work that I’m always doing, so they’re a continual line. They have always been there, I’ve always noticed that I had these lines as part of works, but when I had the space in Richmond, I started to make just the lines, and nothing else but the lines. That year, The Mayor Gallery was closing and the building was going to be demolished. I was invited at the closing of the gallery to make my lines all over, and after that, in 2014, I started to develop my lines, and then I worked out the framing, so therefore that’s when the lines in those particular frames started. I guess there’s an earthy element to them as well, as they are made with the use of sap green and blue colours. Referencing the history of blue, ultramarine, and then cobalt blue, and how cobalt blue almost looks purple, and then greens that look almost blue, so using green had to be addressed. With the green lines, what I can almost find slightly irritating about them, and I want to fight that, but in a way is what makes them work, is that they are so obviously, longingly, wanting to be botanical, organic, and plant-like. How can something made in sap green not look like that? So it’s almost playing with this idea, and it’s quite interesting when they don’t look plant-like, but they obviously should do. These lines are abstract, and they’re not worked out at all in any way other than it’s been quite a long process to figure out what inks I wanted to use, the paper, it’s smoothness, the intensity in the fluidity of the ink, all those practical aspects. It’s like getting the right trainers, and it’s almost like I don’t get lost in the lines. The lines are already there, I just find them. I can make them public like I did them once at an art fair, I think I did an 8 by 5 metre one, and people were just coming over during the weekend. It was quite interesting because sometimes people started talking to me, and I’d just be painting. My work is a lot about what is going on around me, and how I react to it, so when one line drawing is completed, it seems to have been there for ages, but then it has this newness about it. One of your inspirations for this exhibition is English potter Josiah Wedgwood and his use of colour, specifically his use of blue and white. Could you tell us more about your influences? My influence on Josiah Wedgwood goes back to the early 70s. I used to look at people’s mantelpieces when I was at their houses, and observed that on top of these mantelpieces there would be little pieces of the blue and white Wedgwood ornaments. I was struck by looking at them, and as I got older, I understood the history of them, the context, and the “Englishness” of these ornaments, which were placed in beautiful settings. Moreover, I realised it was the colour which was always drawing me into these Wedgwood ornaments. It was just the way that particular blue was bounded with that white. It was the texture of that white, and the matt-ness of that texture, with that dusty, chalky, flatness of the blue. With my sculptures now, I’ve broken it down to the essence of what it is that speaks to me. That rawness. 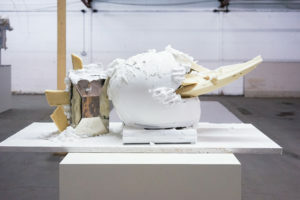 There are a lot of found objects used in your sculptures (from laptops to clothes), but there are also objects ordered and made specifically (plastic/PVC plates), creating a balance between spontaneity and initial planning in your work. In that manner of speaking, do you know how a work is going to look like at the end, or is it changing constantly as you are working on it? Many times, I’ll be starting a work with an initial planning, but then, as I’m going forth into it, other ideas are just enveloping me at the same time, and these thoughts seem more important, so therefore many times these new ideas won’t be what I’ve planned them to be. The sculptures just happen, but I do have ideas in my head that I want to apply to make a sculpture. I can’t plan a sculpture, draw it out, and then make it. To me that way of working is not a love affair anymore. Your practice deals with paintings becoming sculptures, and sculptures become paintings. Could you expand on that concept? Do you feel this idea is explored on your piece “Sculpture, frame on canvas”, 2017? What they are in fact is found objects. I had off-cuts of canvases, so this piece is like freshly picked ‘stuff’. I wanted these works to be sculptures, so they are sculptures that are canvas on frame, and are framed as a painting. There is this freshness about them. I guess that they look as if they could be conceptual pieces, but they are not. It’s the way that I’ve come about making these pieces that are in a way, conceptual, isn’t conceptual. For me, they don’t belong to being a sculpture or a painting; they’re just something that is trapped in not being. 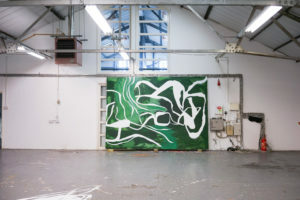 In terms of paintings becoming sculptures, is it visible in your layered green work? 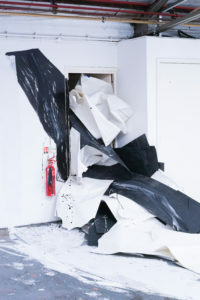 What were the ideas behind this work? For a long time I have wanted to use a white liner and make lines on a grass court that weren’t tennis court lines. In this work, I’ve been able to apply this idea on a tiny scale. Say for example that I could have the opportunity to paint lines on a tennis court, I wouldn’t refer to this piece. In terms of the process, it is made with white chalky lines on top of a depiction of a lush green grass. I have been observing how the light reflects on different parts of the courts in Wimbledon, and how it comes through the trees or buildings. Therefore, in this piece, different tones of greens start to come through. In my work, I have paintings that seem to want to be sculptures, and sculptures wanting to be paintings, and I think that idea comes across in this piece. There is something quite animated going on as well, and then the mark making has all these references to Matisse or Picasso. I think that in a way, this painting might be the closest I have reached to planning. Amongst this, it is integrated with cables surrounding it, and it has certain fluidity to it. 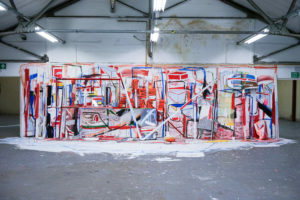 The fact that it is located within a window to the left, and a triangle above it, it’s because of all those elements that the painting is what it is, and transmits a sense of electricity and movement. How did you come across using iPhone boxes or laptops in your work? The laptops weren’t in current use, and it wasn’t really planned. My husband William was having the information taken out of them, and I had already used some computer boxes as plinths for my previous works. What caught me the attention to these laptops was the way in which William came into the house, and plonked them down, and using them just seemed like the obvious thing to do, as they were abandoned. What attracted me about them was also the smoothness and silvery tones of its colour next to the white. I must say, there is so much about my work that is impulsive, but joined onto that; there are huge references from works I have made in the past, and people from the past. These laptop sculptures are very much related to work that I was doing in 2002, named “Sad Sweet Strange Things”. In fact, the first one used a cashmere jumper, and everything about it was just wrong, but that was the rightness of it, it was so tortured, and in a way these new sculptures are abstracts of my previous “Sad Sweet Strange Things”. How important is it for you to use personal objects in your work, such as your daughter jacket? What I do find myself doing constantly is capturing colour wherever it is, and whatever it is. It’s like a hunt, it’s as if I’m a hunter, and in relation to my youngest daughter’s jacket, she used to wear it over her fencing kit, and I used to notice it everywhere in the house. I told her constantly to put the jacket away. It was never put away, and I was just inspired by that colour, that yellow and blue, along with its texture. I therefore realised I wanted it to embody my work, and the obvious thing to do was to use it. I wasn’t finding that colour anywhere else, and it was just a disregarded object. It’s quite interesting how in this piece, the shoulder pad still behaves like a shoulder pad does, and it’s fighting to be abstract. We can question ourselves whether this piece is abstract or figurative, and when making it, it was made in an abstract way. The theme of horses seems central in your show. Where does your fascination with these animals come from? My fascination with horses comes from being alive. Like most young girls, I just loved horses, and as a child I used to draw them. In fact, most girls were into riding horses but I just wanted to be a horse. So, I just pretended it, and I guess that’s where it started. Also, there is such a big history of horses, where they have served humans in war and in practical matters, and also in terms of style and beauty, and I guess now we don’t ‘use’ horses like we used to. Humans have always been able to put so much onto them physically, but with evolving methods such as cars, we don’t do that anymore. On a personal level, I can still use these animals as a tool, and emotionally place things onto them, such as feelings. Contrastingly, there’s the cartoon component in my horse, but there is also this element of trying to be a serious horse painting. How does title of the show “We Have Life” relate itself with the theme of horses? Movement is very important in this sense, and I am thinking back to France, to the first cavemen paintings. What was so fascinating about those paintings was the fact that the artists in those times were depicting the movement and life of these animals. Many scenes from those cave paintings were hunting scenes, with animals such as deers, that were about to be slaughtered with arrows. I guess these painters were capturing those last moments of that time, where the animals were free and alive, and that adrenaline rush of trying to stay alive before people would kill them. That moment is very attractive to me, and I feel that energy within my horses. In terms of the title of the show, it reflects upon being in this moment, now. Your use of material in some works incorporates temporary substances, such as washing powder, which by adding water will instantly disappear. You mentioned the idea of constantly living yet you are using such fragile materials to represent this idea. Yes, but then I guess life itself is fragile. Even when people start establishing things, such as buildings or structures, they still only have a certain timeline. 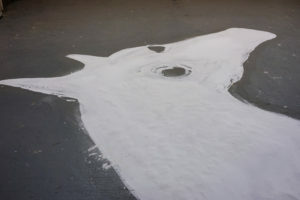 What is interesting about being able to create this white horse with washing powder is that originally white horses were drawn on the English countryside, with the use of materials such as chalk, drawn in the ground. 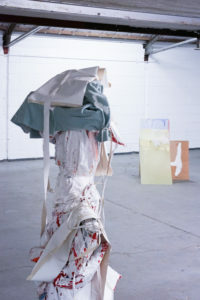 In a practical way, I wanted to gather what I could, to express that in a contemporary way, being alive now, in a warehouse, and therefore washing powder was the substance that I could grab immediately to get to point across. Your portrait drawings are a continuous aspect of your practice. Could you explain us further your portrait of Georgie Hopton, and why you chose her as the subject of your work? Georgie Hopton is an old friend from art school, she was studying Fine Arts and I was doing Fashion at Central Saint Martins, and we became friends soon after we left college. I have sketched her three times in three different periods in the last 30 years in which I’ve drawn Georgie. In this particular portrait, she sat for me for the day, and it was really fantastic to make this piece because of the scale of it. On a personal level, I normally make portraits and figurative works that are smaller, so just to scale it up to bigger than life levels was really fabulous and it’s obviously wet an appetite to continue to make portraits this size. On another note, I remember when my youngest daughter was fencing competitively, and her coach used to say to her that she needed to make the fencing competition her home, because that’s where you normally get excited or scared, so that sporting psychology was really helpful in making this piece. This portrait captures that feeling of being tortured, and accepting that being in this state is your home place. Around it, in the floor, I placed in a work that resembles a gigantic Wedgwood piece. 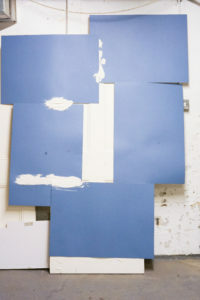 I got some plaster, and stuck it on a canvas, and then painted the background blue, to stick it. I then got into this white plastering technique that I’ve been using as another tool, and it has become a regular ingredient now. What’s particularly fun about this floor piece is that in Calcutta or India, you get people collecting cow poo and making them into patties. I used to see this when I was a young girl, and they would use these patties for fuel. So, my floor piece resembles in a way those cow patties. Having in mind that you are an independent artist, how important is for you to have a certain creative autonomy? What does it give you, and at the same time, is there something that it takes away from you? Well, It would be interesting to know what it takes from me. Everything is in constant change, and for the moment, this is what I’m grabbing hold of, this is the system, this is my life, this is what’s going on, but actually by the end of the week, that’s not my life anymore, and it’s a completely different story that’s taking place. From experience, so far, just going on independently this since 2013, without a gallery representation, it’s meant that I do what I want, when I want, for who I want, and not work with people who I don’t want to. Having said that, I’ve had a couple of galleries that have wanted to work with me, and it just hasn’t felt right. I do collaborate with people on projects sometimes, when it’s right, and I guess if someone comes along, and they happen to be a gallery, and I’m excited by them and they’re excited by me, it’s almost like you don’t really have to explain it. Then maybe at that point I’ll understand what I’m missing out on. How do you see yourself in 5 to 10 years? I would love to carry on doing everything that I’m doing at the moment, to be in the beginning of something. I’m really inspired by Louise Bourgeoise, and the fact that she brought up her boys, and I think then she was able to work, and to work, and to work, and to work, and to work, and to work. That would be a dream, to just work, and I do love monumental spaces, and hugeness. I love heights, and I have no fear of them. I always enjoyed jumping off really high diving boards, and cliffs. I’ve got this feeling about not worrying about perspective. I’d love to have more and more opportunities. Your husband William is an important part in your studio. Could you explain his role, and how he integrates directly or indirectly with your practice? I don’t know if artists create work for an audience, but in a way, I make works for William. If no one was ever commissioning me commercially and I wouldn’t have to make a living, I would just keep doing what I’m doing. I would just be making these works, and asking William if he likes them. I must also say that when I make work, he has absolutely no influence on me at all. Although, after I’ve already made a piece, the influence he has on me is huge. Although my response to his response doesn’t mean that I’m going to make something that he likes. Many times I might completely not agree to what his thoughts are. It’s not as if I’m trying to make something that he enjoys, I’m just pushing myself continually to make what I can, and what I want to. But it’s interesting for me to know what his response is towards my work. Sometimes, there’ll be pieces that the more he has fallen out of love with, the more I will have compassion for. Having said that, when I work, there has been so many times that my family have been around, like the children and William, and sometimes, people that work for me. They all put their bit in, uninvited normally, and I’m always interested to see what they see and what they ignore. Many things just get ignored a lot, so to a point it’s interesting. Mostly, it is out of my personal necessity to produce, and I almost feel that I have a responsibility to make works. When I’m in a situation, whether at risk of being ignored, loved, hated, ridiculed, etc., if I’m able to do works, then I have to do it, it is a responsibility. If you want to do something, and there is another thing that prohibits you of doing it, because you are too nervous of failure, being ignored, disliked, or whatever reason, just don’t worry about any of that. I think that if you want to make work, you have the responsibility to make it. You have to seize the day, life is a gift, we don’t know how long we are here, and we’re all like lambs to slaughter. We could be gone in an instant, and there’s so many people out there that would be longing to be great scientists, musicians, or artists, but they can’t even get water, so, if you have got drinking water and tap, and you want to be an artist, well, I think you should, at whatever level.